What do you know about the pH level of your organic farming soil? The pH level indicates the relativity and alkalinity of the soil. You can test the pH level of the soil through a pH test which measures the ratio of hydrogen (positive) ions to hydroxyl (negative) ions in the soil water. When hydrogen and hydroxyl ions are present in equal amounts, that means that the soil has a neutral pH level (pH 1 to pH 6.5). When the hydrogen ions are higher, the soil is acidic (pH 1 to pH 6.5). But when the hydroxyl is higher, the pH level is more alkaline (pH 6.8 to pH 14). The reason why most plants grow best at pH levels of 6.5 to 6.8 is that the most essential plant nutrients are soluble at that level. The problem with soil that does not have the right pH level is that soil nutrients start to become chemically bound to the soil particles. This makes the soil incompatible for the plants. The health of the plants then suffers because their roots are unable to absorb the nutrients coming from the soil. Some nutrients also “die” because of the wrong pH level of the soil in organic farming. If you want to improve the fertility of your soil, you need to make sure that the pH level of your soil is within the range of 6.5 to 6.8. But the process will take time. You cannot expect your soil to correct its pH level overnight. Correcting the pH level of your soil will last over one or two growing seasons. You also need to maintain it after. You can also try applying organic matter liberally over the soil because it can moderate the imbalance of the pH level. Soils in the eastern half of the US are usually more acidic. It then may be too acidic for most garden plants although some plants and flowers such as blueberries and azaleas. The most common way to make your soil less acidic is to add powdered limestone because this adds manganese to the soil. It is best to apply it during the autumn season. Soils in the western half of the US are usually more alkaline. You can add ground sulfur to acidify the soil. 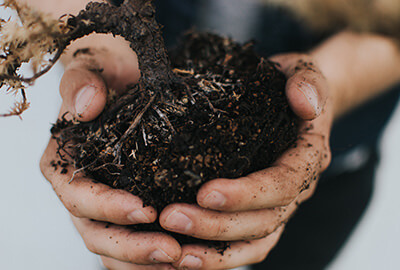 There are also naturally acidic organic materials such as conifer needles, sawdust, peat moss, and oak leaves that you can incorporate into the soil.